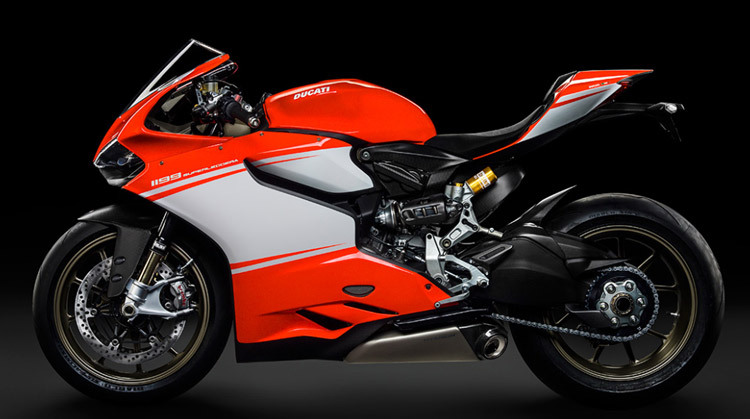 Introducing the new Ducati 1199 Superleggera. Its components, incredible as they may be on their own, become something even greater under the Superleggera’s cohesive vision – to exceed every limit of light weight and performance. The 1199 Superleggera’s form expresses this goal perfectly. 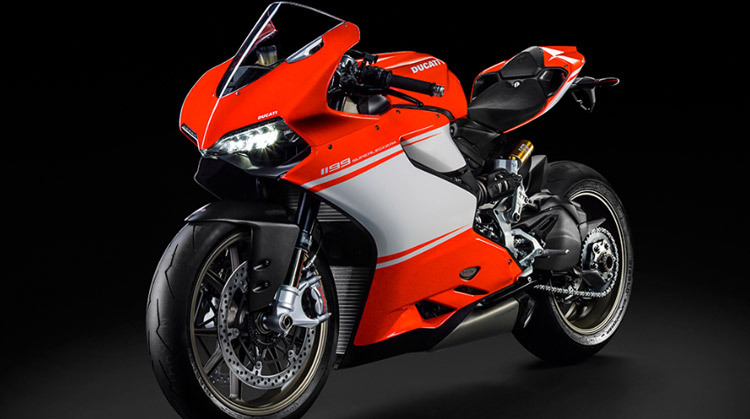 Sleek and aggressive, it is based on the award-winning design of other Ducati Superbikes but features a modified front cowl shape for increased aerodynamic performance at high speeds. Fashioned entirely in carbon fibre, the bodywork wraps tautly around the 1199 Superleggera’s muscular interior and is finished in unmistakable Corse Red to announce the performance within. The end result is simply the most impressive Ducati ever offered. Fully street-legal, it features ABS, mirrors, lights, and long standard maintenance intervals; while being as light as a full World Superbike and making comparable power. 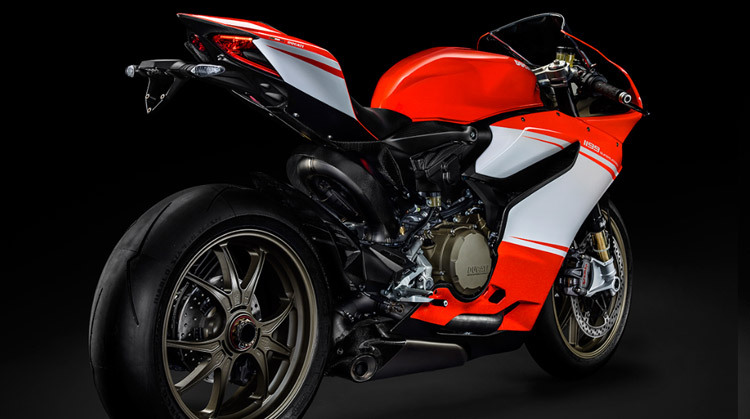 An engineering dream made real, the 1199 Superleggera sets new standards of motorcycle construction, paving the way for the entire Superbike lineup in Ducati’s never-ending quest to advance performance. Contact us today to book a test ride and find out our latest special offers on Superleggera. 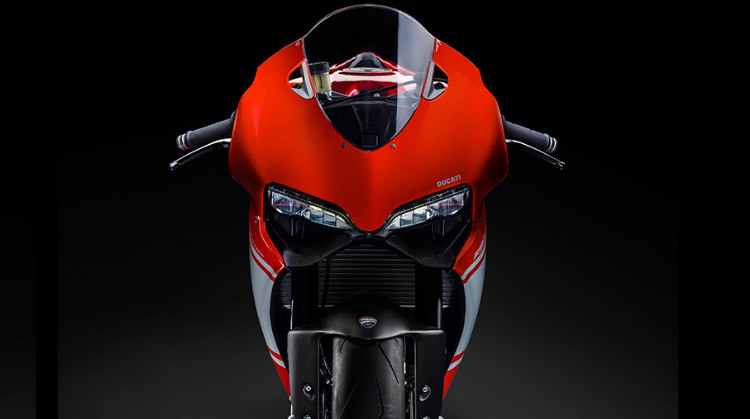 The 1199 Superleggera is the most exclusive and extreme Ducati ever made. An unprecedented 200+ horsepower in homologated configuration (205+ with included racing exhaust) and a 166Kg weight ready-to-ride without gas (around the same as a Superbike in full racing trim) give it the best, by far, power to weight ratio of any homologated motorcycle. Accordingly, Ducati’s test rider Alessandro Valia has obtained with the 1199 Superleggera the best time ever for a street Ducati around the Tuscan Mugello circuit, an incredible 1’54”9. Included with each 1199 Superleggera is a “track kit” to adapt the bike completely to closed-circuit use. The kit is composed of pieces which, when mounted, add to the bike an additional 5 horsepower, and shed an additional 2.5Kg. It is the finishing touch, to unleash every last bit of the 1199 Superleggera’s incredible performance. To be fast – the primary goal of any performance motorcycle. Perhaps the most essential component of speed, acceleration gives a bike its visceral thrill on the street and enables scorching lap times on the track. In a strictly technical sense, the acceleration of a motorcycle is a function of force and mass; to increase it, one must either increase the bike’s power (force), or decrease its weight (mass). In accord with 1199 Superleggera’s extraordinary nature, its engineers pursued both components of acceleration, giving it maximum power and minimum weight to make it phenomenally quick. Maximum power begins with an “R” spec Superquadro engine, already the world’s most advanced twin-cylinder. Titanium exhaust valves are added to its titanium intake valves, all of which are precision-actuated Desmodromically using a dedicated high-performance camshaft. Low friction 2-ring Superbike pistons are fitted, and the combustion chamber’s “squish” area is modified, raising compression to 13.2:1. The power of combustion is transmitted by titanium rods to an ultra-strong, ultra-lightweight crankshaft, perfectly balanced with exotic tungsten counterweights; while spent gases exit through a high-flow titanium exhaust. 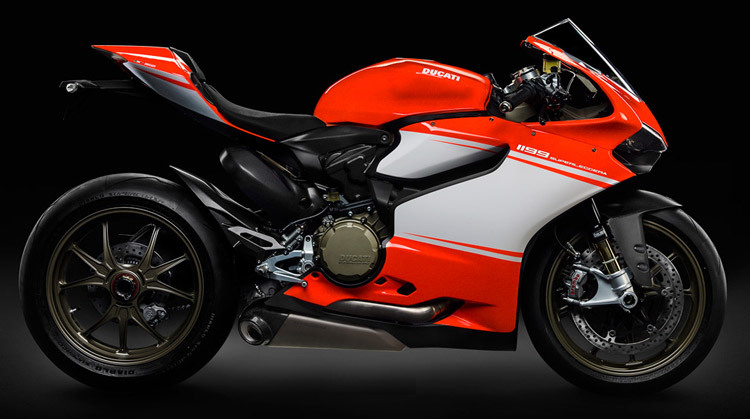 The combined result is a stratospheric 200+ hp - the most powerful street engine Ducati has ever made. You will find the full selection of Ducati superbikes at Ducati Manchester. We offer new and used Superleggera and Panigale for sale, backed up with an excellent service department, and a full range of panigale parts and accessories. 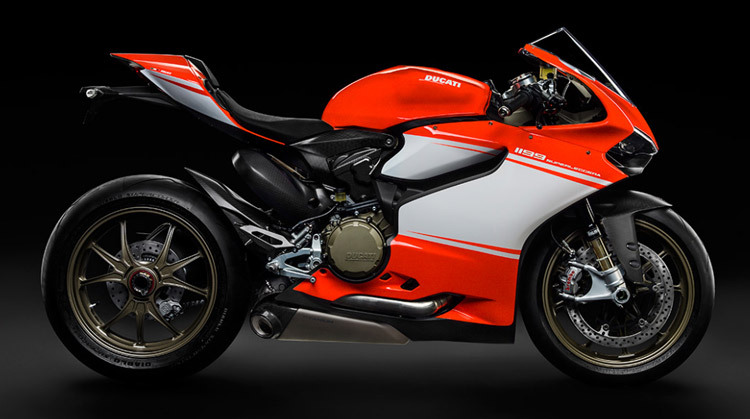 Customise your Superleggera with our full range of 2014 Ducati 1199 Parts & Accessories online. Also at Ducati Manchester we have a full range of 2014 Ducati Corse Clothing & Accessories available at our online Ducati Store. We offer a range of affordable finance options on new & used 1199 Superleggera motorcycles.